ST. GEORGE – No. 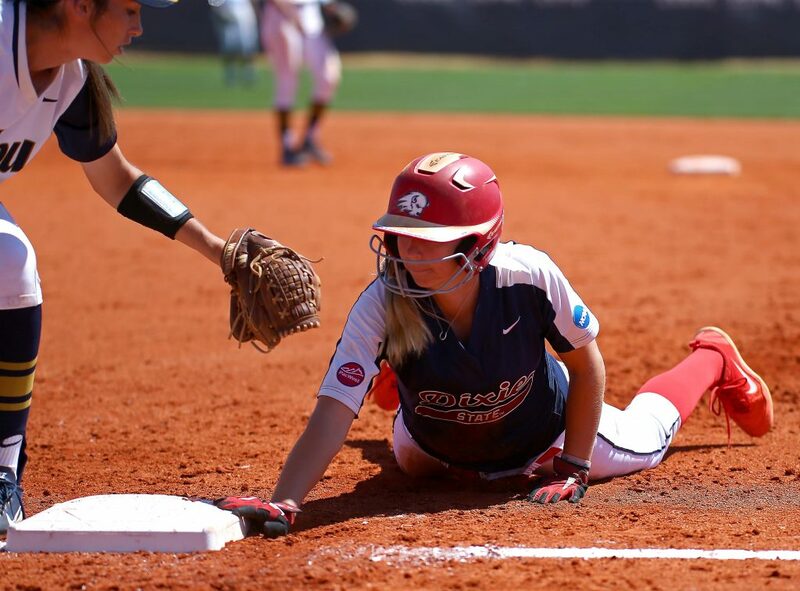 6 Dixie State softball and No. 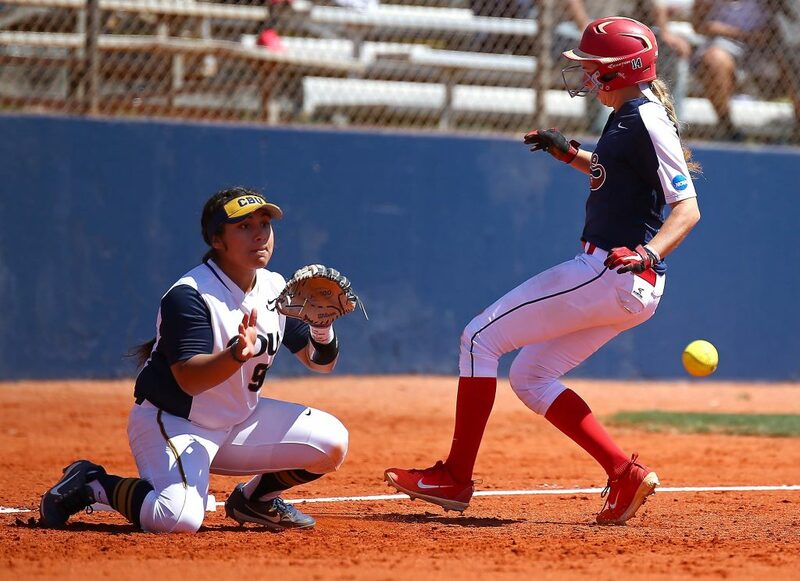 14 California Baptist played to a doubleheader split on Saturday at Karl Brooks Field. DSU rallied for a 9-8 win in 10 innings in the opener, while CBU earned a 9-0 shutout victory in game two to force a 2-2 series split. 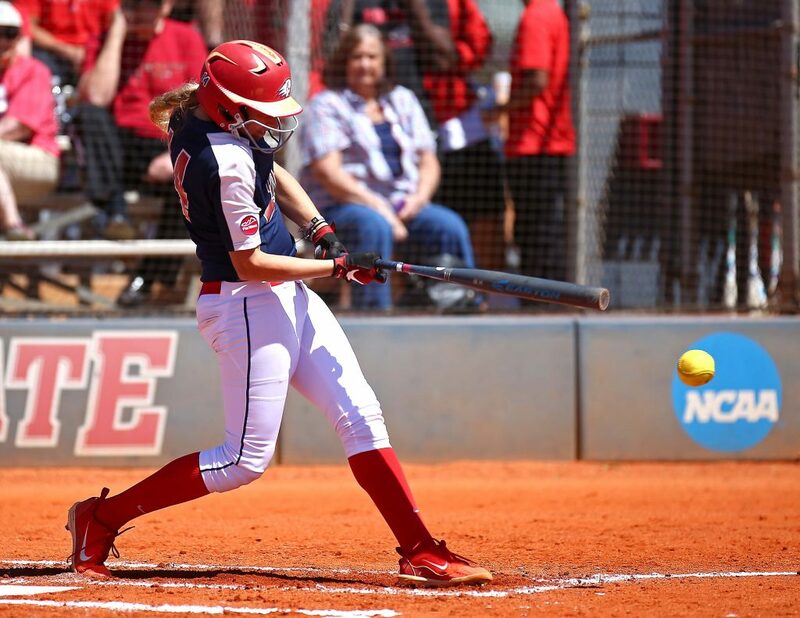 The Trailblazers (34-6, 18-6 PacWest) overcame two separate two-run deficits in game one and scored three runs in the bottom of the 10th inning to secure the win. 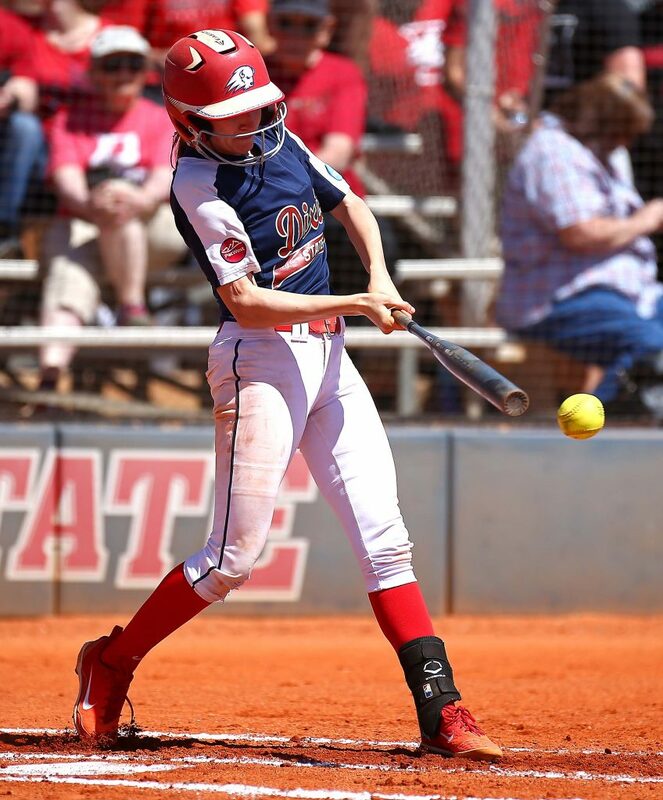 But DSU managed just two hits in the second game, suffering its first shutout loss of the season. 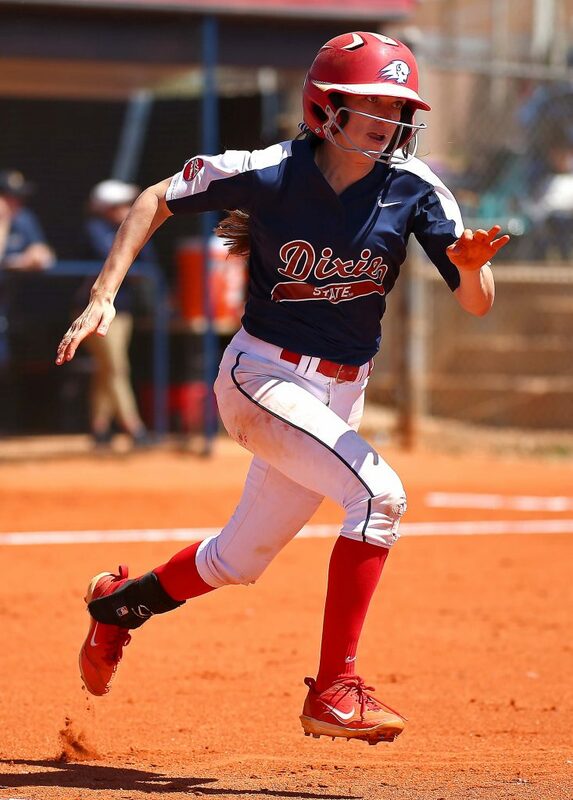 Dixie State looked to take an early lead in game one, putting runners on first and second with only one out in the bottom of the first inning. But the CBU defense stiffened and retired the next two DSU batters to escape unscathed. The Lancers took the momentum into the top of the second, scoring two runs on two hits to take a 2-0 lead. 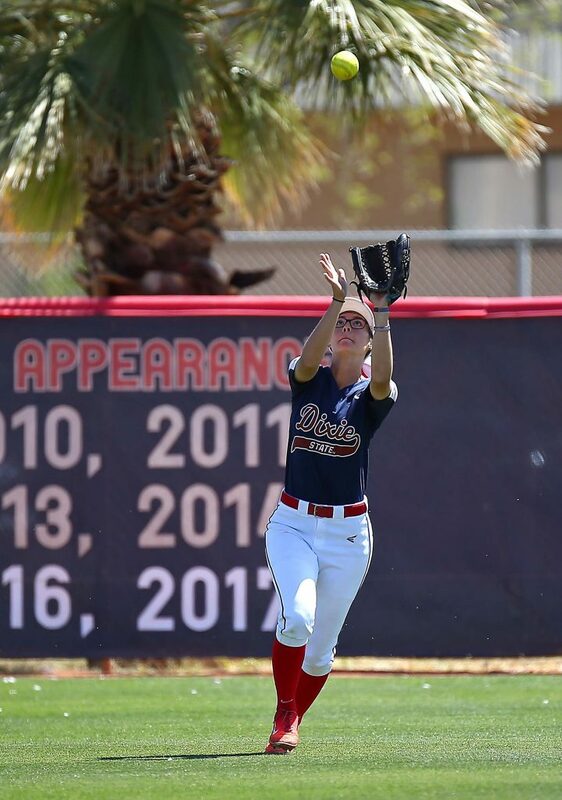 CBU looked to add to the lead in the third inning on a line drive to center field, but Janessa Bassett ended the inning with a leaping catch into the fence. The lead held until the fifth inning, when the Trailblazers exploded for six runs on five hits. 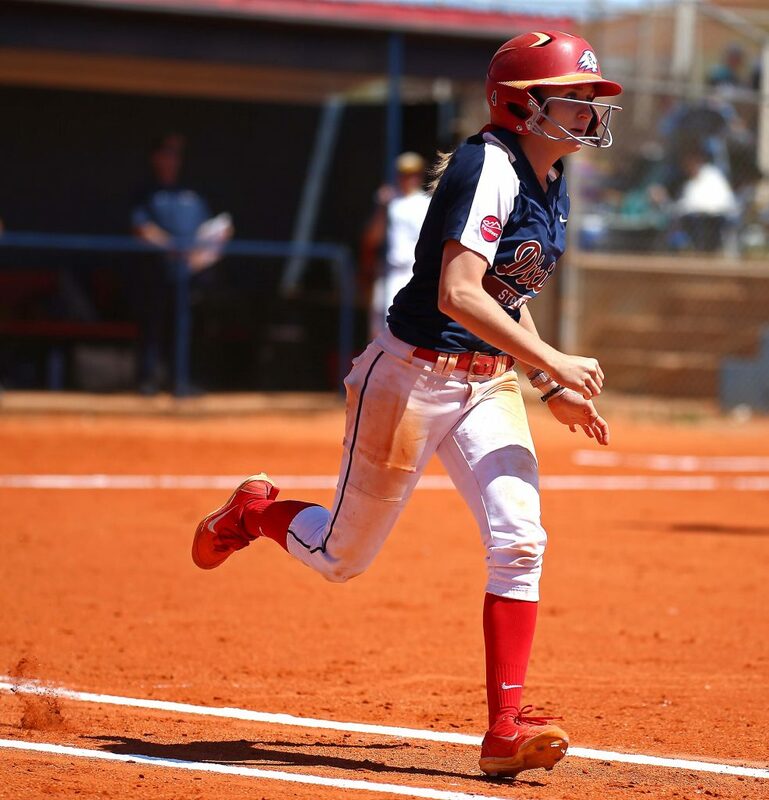 Kaitlyn Delange drew a leadoff hit-by-pitch, followed by a Janessa Bassett single. Brenna Hinck advanced both runners with a sacrifice bunt on the next play, followed by a Bailey Gaffin walk to load the bases. Kenzie Sawyer got DSU on the scoreboard three pitches later with a two-run single to right field to tie the game at 2-2. 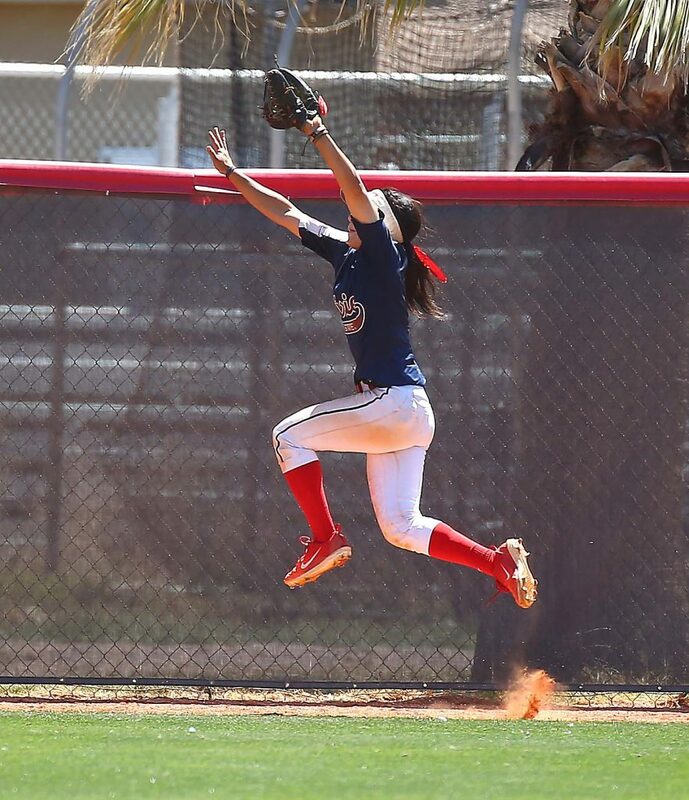 Jessica Gonzalez surprised the CBU defense with an RBI-bunt single on the next play, scoring Gaffin from third. 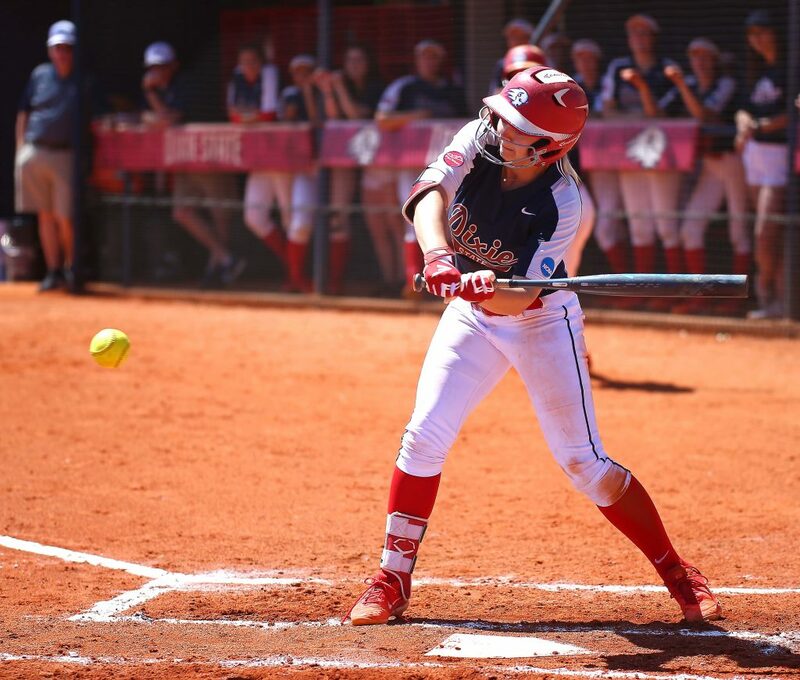 Cassidy Morton plated two runs later in the frame with a scorcher off the CBU shortstop’s glove and into left field. Two pitches later, Kaitlyn Delange drove an RBI-single to center field to push the lead to 6-2. 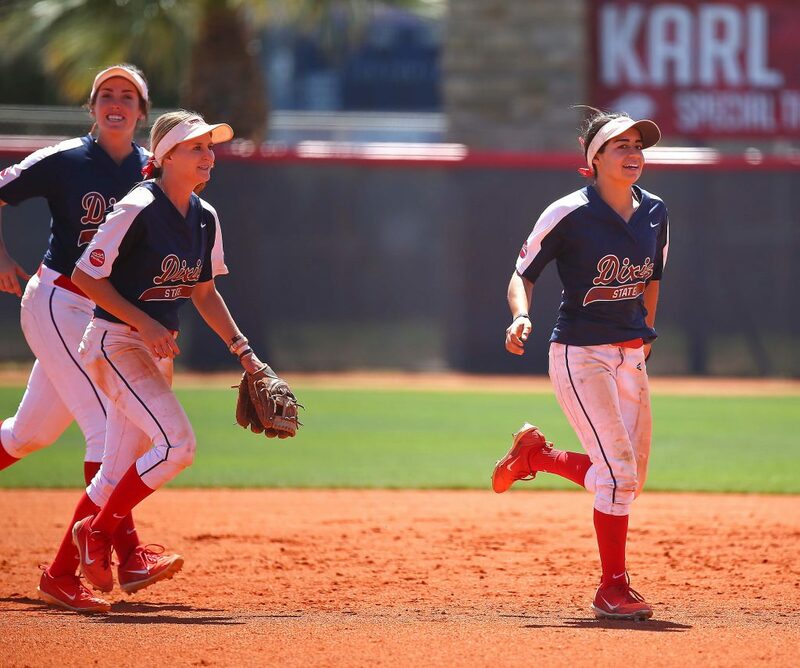 Dixie State appeared to have the game in hand with two outs in the top of the seventh, but the Lancers tied the game at 6-6 with back-to-back home runs. The Trailblazers would go empty in the bottom of the seventh, and the game headed to extra innings. Neither team managed a run in the eighth or ninth inning, and the international tiebreaker rule took effect in the 10th inning. The Lancers started the top half of the inning with a runner on second, but the runner wasn’t there for long as the visitors took an 8-6 lead with a two-run home run. Unfazed, the Trailblazers rallied again in the bottom half of the inning. 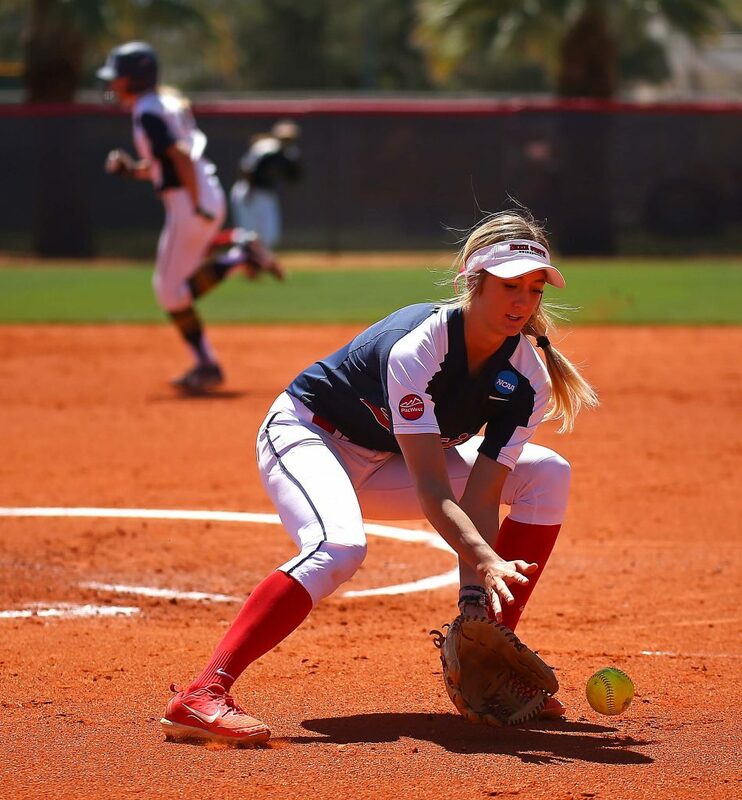 After Morton was placed on second to start the frame, Bassett moved her to third base with an infield single. 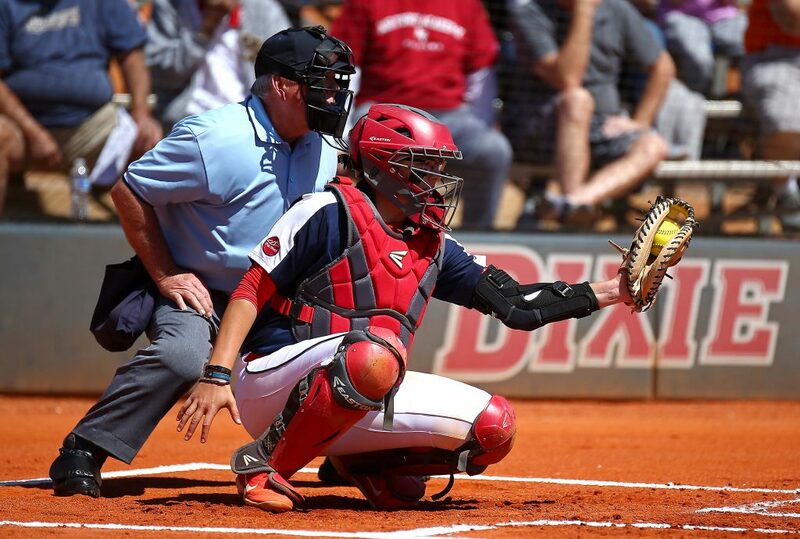 Bassett then stole second, and the throw from the CBU catcher sailed into center field, allowing Bassett to advance to third and Morton to score from third. Bassett scored on the next play on a Hinck infield single to tie the game at 8-8. Gonzalez ended the game later in the inning with a walk-off single up the middle to seal the 9-8 victory. 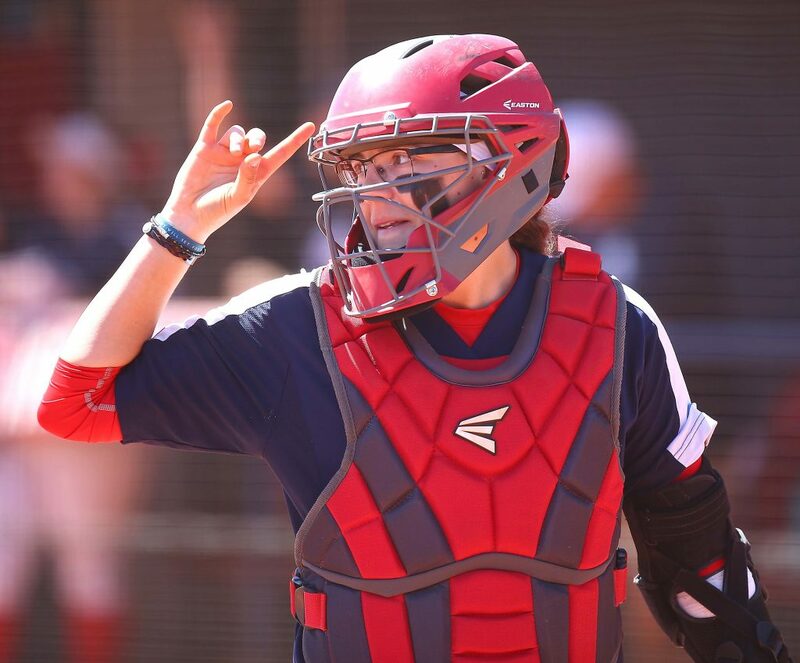 Gonzalez led four DSU players with multiple hits, finishing with three hits and two RBI. Cambrie Hazel, Alexis Barkwell, and Madi Dove each spent time in the pitcher’s circle, while Dove (3-1) earned the win after entering the game midway through the 10th inning. 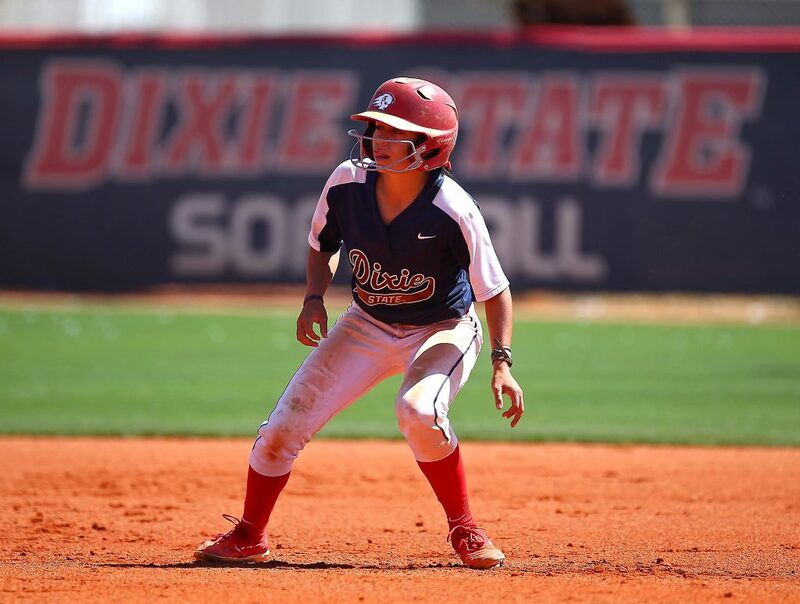 Dixie State saw a golden opportunity to take an early lead in game two, placing runners on first and second with no outs. But the Lancers recorded outs on the next three plays to keep the game scoreless. CBU scored in the next four innings, plating three runs in the second, and two runs each in the third, fourth, and fifth innings, to build a 9-0 lead. 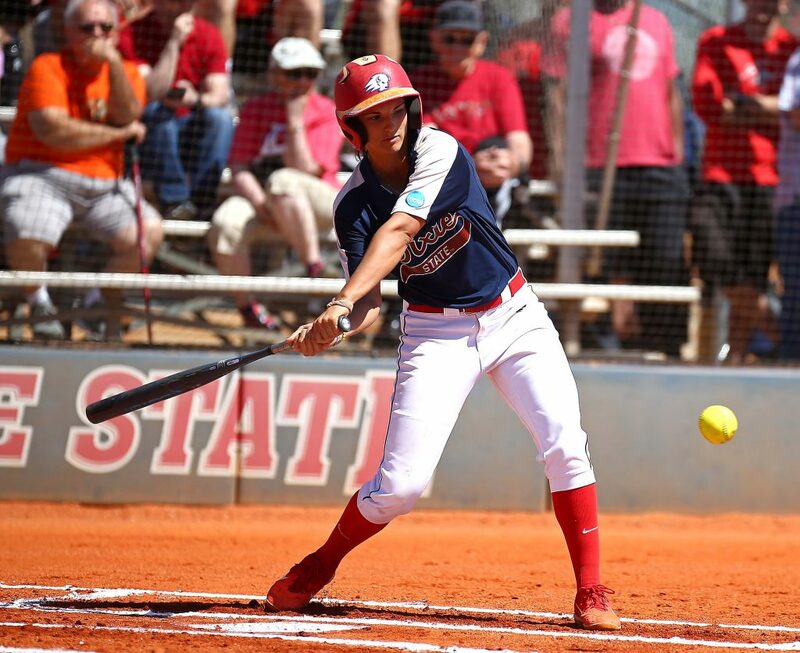 Meanwhile, the Trailblazers managed just two hits and left eight runners on base throughout the game and could not overcome the deficit, suffering their first shutout loss of the season. 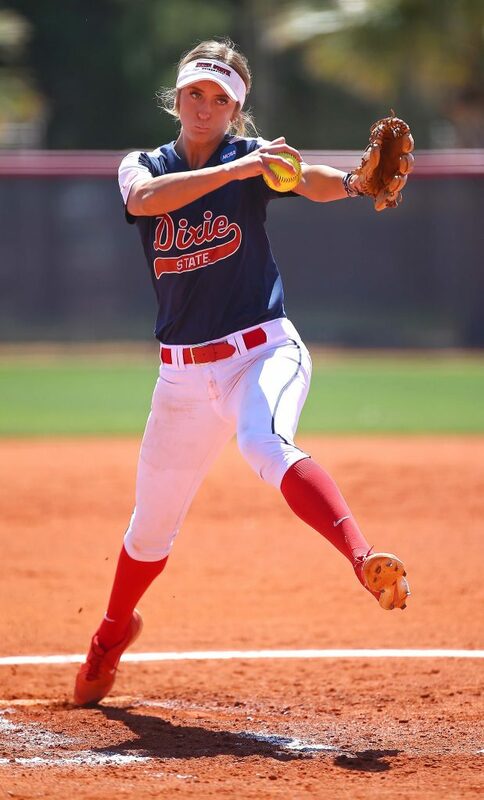 Sawyer and Morton logged the only DSU hits, while Alexandria Melendez (9-2) took the loss in the pitcher’s circle. 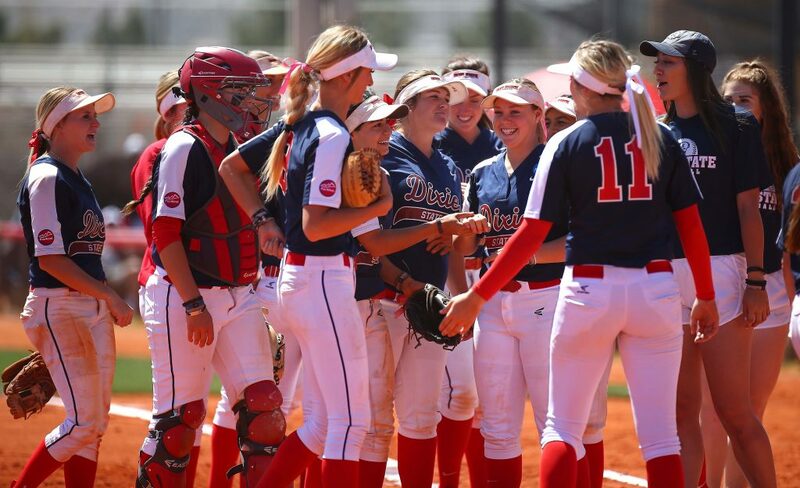 Dixie State now heads to Biola and Concordia-Irvine next week for its final conference road games of the season.